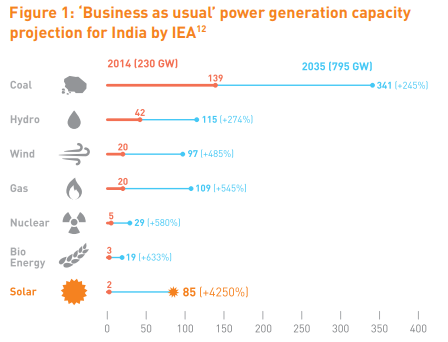 How should India drive its solar transformation? Beehives or Elephants? BRIDGE TO INDIA’s INDIA SOLAR DECISION BRIEF, “How should India drive its solar transformation? Beehives or Elephants”, examines the ideal solar road map for India through comparative analysis of four distinct scenarios of solar power generation – residential rooftops, large rooftops, utility scale projects and ultra-mega projects. The report compares four distinct scenarios of solar power generation – residential rooftops (solar bees), large rooftops (solar pigeons), utility scale projects (solar horses) and ultra-mega projects (solar elephants).Each scenario is analysed in terms of not only levelized cost of energy (LCOE) but also landed cost of power (LCOP) which measures the cost to a consumer at the point of consumption, rather than at the point of generation. The LCOP, in certain scenarios could be as much as 30% higher than LCOE, and should become the de-facto economic metric for India to examine various power options.